Today is a big day for me as my very first first-author paper is published online today in Current Biology. Non-scientists can check out the press release here. I would like to celebrate by sharing my own #knityourthesis project - these bacterial cell cycle fingerless mittens. Our lab cartoon detailing the bacterial cell cycle. DNA is blue and the cell divsion protein FtsZ is in red. My thesis research in the Levin Lab focused mainly on identifying how the bacterial cell cycle is regulated. In particular, I studied what happens to bacterial cells when you block them from dividing, as would be the case when you treat them with antibiotics that block the cell cycle. As outlined in my paper, I uncovered some previously unidentified regulatory mechanisms that ensure proper cell cycle progression, which is very important for maintaining bacterial cell populations. I also discovered that cells blocked for division enter a zombie-like state where they remain alive but can no longer reproduce. As a result of my work, I was able to star in a youtube video that explains the bacterial cell cycle here. Here is to hoping that goes viral and helps a lot of people understand the bacterial cell cycle. I originally designed these cell division mitts as a present for my boss, Petra Levin upon my graduation. I based the design on a cartoon detailing the bacterial cell cycle that appears in almost all of the presentations by our lab. I liked the mitts so much that I am now making a pair for myself. I also am making a hat that details the bacterial cell cycle that I am sure will be featured in a future blog post. 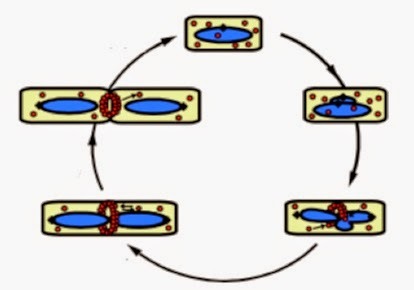 The bacterial cell cycle begins with a newborn daughter cell (top left). The DNA (blue) replicates and the cell division ring (red) forms at midcell (bottom left). The ring serves as the site for new cell wall construction that septates the two new daughter cells (right - top is a cell about to divide, the bottom is the result).